Do you recognize these Keweenaw History photos? the screen for the key. ANNOUNCEMENTS -- This is a test web site designed only to be seen by KCHS Board members. It is based on the existing KCHS web site, uses the much of the same content as the existing site but has major technical and design changes and additional content. Take the link below to the announcements page for all the details. All of the KCHS Museums are closed for the 2013 season. We will post the 2014 schedule of activities in the spring. Check the Sites and Museum Schedule page for hours and locations for all 11 KCHS museums for the past 2013 season. Press here to see all of the current announcements. Keweenaw County is Michigan's northernmost county, and its smallest (in population). The county comprises the upper half of the beautiful Keweenaw Peninsula, that beckoning finger of land that sticks out into Lake Superior. It is a region rich in history as well as natural beauty. Copper mining is a major historical theme, but commercial fishing, lumbering, maritime and life-saving history, and various ethnic stories are notable, too. To discover, document and disseminate the history of Keweenaw County through research, historical property preservation and restoration, development and maintenance of historical museums and archival collections, the production and publication of historical focused media and the conduct of historical education programs and events. See the Site Calendar page for the hours for our museum sites which are typically open from Mid-May or Mid-June until October. Check out our publications page. Visit this web site for frequent updates about the activities sponsored by the KCHS. Maybe you'd like to become a member and receive our award-winning quarterly newsletter, "The Superior Signal." Welcome! The picture in our Web banner is of the Eagle Harbor Light Station, on the shore of Lake Superior. This property is owned by the Keweenaw County Historical Society and is the site of its major museums. The lighthouse was built in 1871 and the light is still operated by the Coast Guard. The white building with red roof to the right was the fog signal building and now houses a maritime museum. The other two buildings were assistant light keepers' dwellings. The white building now houses a commercial fishing museum and the Society archives, and the brown building is available to Society members in the summer as a holiday cottage. Photo Notes: The color image of the Eagle Harbor Light House on the page banner was taken by Larry Molloy who is also the webmaster for this site. Unless otherwise noted all 'current' images on the site were taken by Jack Marta or Larry Molloy. 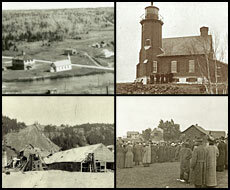 The composite images on this page are from the KCHS photo archives and are, in clockwise sequence: The Eagle Harbor Lighthouse; the dedication of the Douglass Houghton Monument in Eagle River, Oct. 10, 1914; the old stamp mill at the Cliff Mine; a view of Phoenix showing the church (which still stands) and the long demolished Phoenix school. Copyright: All content of this web site, including text, photos, maps, drawings, etc., are copyright © 2010-2020 The Keweenaw County Historical Society. All rights reserved. Where is Keweenaw County - Keweenaw County is at the tip of Michigan's Keweenaw Peninsula. Need a map? The KCHS web site uses Google Maps to help visitors locate our sites and museums. 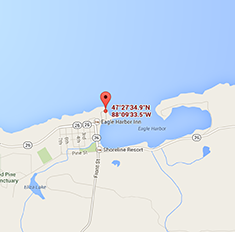 For example the map below points to the Eagle Harbor Lighthouse Complex. Click on this small Google Map to open a larger version that will give you complete access to a larger Google map of the area, satellite view, etc. You may use this link to go to Google Maps Help if you are not familiar with Google Maps. Related Links - You may wish to explore the following sites for additional information on the Eagle Harbor Lighthouse.